The Samsung Galaxy S3 launched over the summer, but its unorthodox colors - white and "pebble blue" - may have turned off technology purists who only want their gadgets in a black to match their souls. The addition of a red Samsung Galaxy S3 to AT&T's stable did little to help assuage the more reserved and color-averse in the tech world, though free spirits and attention-seekers loved its flashy burgundy. But the fabled black Samsung Galaxy S3 could arrive soon, and online retailer Clove fueled the rumors with a new report. The mobile technology seller claims that the unlocked version of the black Samsung Galaxy S3 will drop in October with a new 64GB option, though pricing details are still scarce. 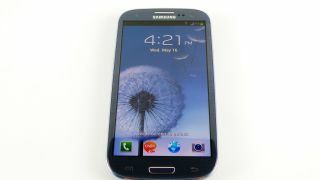 The black Galaxy S3 will even (probably) launch with Android 4.1: Jelly Bean, which is expected to come to all Galaxy S3 devices on August 29 (check out the video one early Jelly Bean recipient filmed on Wednesday). Samsung may still try to keep the black Galaxy S3 under wraps, but the South Korean company appears to have a leak called "retailers." You see, Clove's isn't the first report to out details about the black Galaxy S3. On Monday, independent retailer Mobile-Fun.co.uk put the black handset up for pre-order, claiming stock would arrive in four to six weeks, and that the unlocked 16GB model would go for a steep £499.99 ($782). Another retailer, Expansys, revealed a similar deal on Thursday. The weekend prior, the black Galaxy S3 popped up in the internal inventory of yet another retailer - Carphone Warehouse. The Samsung Galaxy S3 is currently available with either 16GB or 32GB of internal storage, though space for a 64GB microSD card exists in both models. But let's not forget that the 64GB Samsung Galaxy S3 was promised by the tech giant itself prior to the Galaxy S3's release. It's been MIA so far, though in July a Samsung spokesperson revealed that "the 64GB model of the Galaxy S3 will be available during the second half of this year." That falls right in line with Clove's claims, as October certainly qualifies as the second half of the year. Depending what the iPhone 5 ends up looking like (it probably won't be blue or red), Samsung's possible fall black Galaxy S3 release could be a strategic move to stay up-to-date with Apple's aesthetic. Of course, that might not go over well in court.